Advanced Glass Market size was over USD 60 billion in 2016 and industry expects consumption of above 10.5 billion square meters by 2024. Increasing demand for better aesthetics in both residential & non-residential buildings along with growing industrialization rate in India, Brazil and China has stimulated advanced glass market size. Growth in automotive manufacturing base with supportive government initiatives for development of infrastructure has propelled product demand. Increase in energy efficient buildings growth in Germany, UK, France and The Netherlands along with FEMA and LEED standards for safety applications will enhance product demand. Growing toughened glass demand in furniture, mobile gadgets and cookware owing to durability, reliability and thermal shock resistance will support industry growth. Global consumer electronics market may surpass USD 1.5 trillion by 2024. The product is used in mobile phones, tablets and computers, mainly as screen protectors. Rise in demand of electronic gadgets with increase in manufacturing base in Poland, South Korea and Japan has led to increased adoption of advanced glass market demand. Rising demand for better infrastructure in commercial, institution and health has propelled the growth of advanced glass market. Global infrastructure expenditure may surpass USD 12 trillion at the end of 2024. These products can save up to 25% energy and cut down CO2 emissions, which are mainly wasted in these buildings due to installation of air-conditioning systems. Increased usage of coated glass in improving the energy efficiency of non-residential buildings including offices, institutions and hospitals will boost product demand. Increased application range in windscreens and mirrors will stimulate advanced glass market size in automotive sector during the projected timeline. Over 18 million units of motor vehicles were manufactured in 2016 in Europe whereas commercial automotive production in China exceeded 3 million units. Change in consumer lifestyle with rise in disposable income have driven automotive industry, thus supporting product demand. Soda ash, silica sand and natural gas are the prominent raw materials used during the advanced glass production. Demand supply gap in raw material availability with high transportation and infrastructural cost may challenge industry profitability and impact industry growth. Strong emphasis on usage of renewable energy resources along with stringent regulations pertaining to energy efficiency will provide advanced glass market growth opportunities. 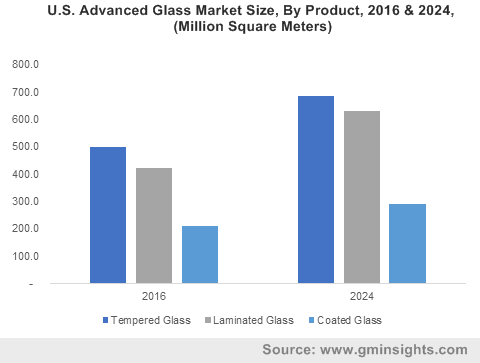 Tempered glass market demand may exceed USD 40 billion by 2024 owing to its increase in residential and commercial buildings. It has the capability to break into small harmless pieces upon impact, thus reducing the injury risk. Favourable government schemes in construction projects along with widespread application usage in smartphones, laptops and tablets as screen protectors will propel advanced glass market demand. Tempered glass market demand from residential buildings may register growth at over 5.5% by the end of projected timeframe. Increasing government expenditure in residential projects in France, UK and The Netherlands along with broad range of product usage in cookware, refrigerators, dishwashers, furniture and microwaves will stimulate product demand. Laminated glass market size may surpass USD 45 billion during the forecast period. Shift in consumer preference pertaining to modern architecture with improved aesthetics and infrastructural development has led to growth in construction expenditure in India, Brazil and China, resulting into growth in product demand. The product is used to block up to 99.9% of the UV rays. It offers high strength which prevents on breaking up into large sharp pieces on impact, resulting into increased demand in automotive windshields application. Low emissivity (Low E) coated glass from commercial building applications will witness steady gains close to 6.5% as it enhances the energy efficiency of the buildings and diminishes the size of carbon footprint. These products are used to reflect the heat inside the building. Changing lifestyle patterns, increased demand for better infrastructure and stringent rules regarding carbon emission will propel advanced glass market demand. Hard coated glass from automotive windshield applications may be valued at over USD 1.5 billion at the end of 2024. Over 2.6 million commercial vehicles were manufactured in the U.S. in 2016. Increasing product usage in automotive windshield owing to high tensile strength and abrasion resistance along with strict environment norms by EPA and REACH to reduce carbon emission by minimizing overall weight of the vehicles will stimulate advanced glass market demand. Europe advanced glass market demand, driven by Germany, Poland, France, and UK would register significant growth at over 4%. Increase in government spending for energy efficient buildings, institutions and hospitals along with various norms for energy efficiency and carbon emissions owing to environmental concerns may stimulate regional market growth. Increasing solar control glass applications in buildings could minimize the usage of air-conditioning systems, resulting into cutting down of 300 million tons of unwanted CO2 emissions and save energy which is wasted in both residential and non-residential buildings. China advanced glass market size may surpass USD 19.5 billion by 2024 owing to its increased application scope in automotive and construction sectors. Easy availability of labor along with low production costs will support industry participants to set up manufacturing units in the region. China witnessed an increase of over 14% in production of vehicles from 2015 to 2016. National New-Type Urbanization Plan proposed by the Government of China has led to increase in infrastructure spending, thus favoring industry growth. Brazil advanced glass market demand from construction applications will witness significant growth at over 6% during the forecast period. Brazilian government has introduced Growth Acceleration Program (PAC) for the development of infrastructure in the country, thereby stimulating industry growth. Rapid urbanization and demand for affordable housing has led to growth of both residential and non-residential buildings. Rise in service sectors such as IT and growth in automotive base in the region has propelled industrial advanced glass demand. 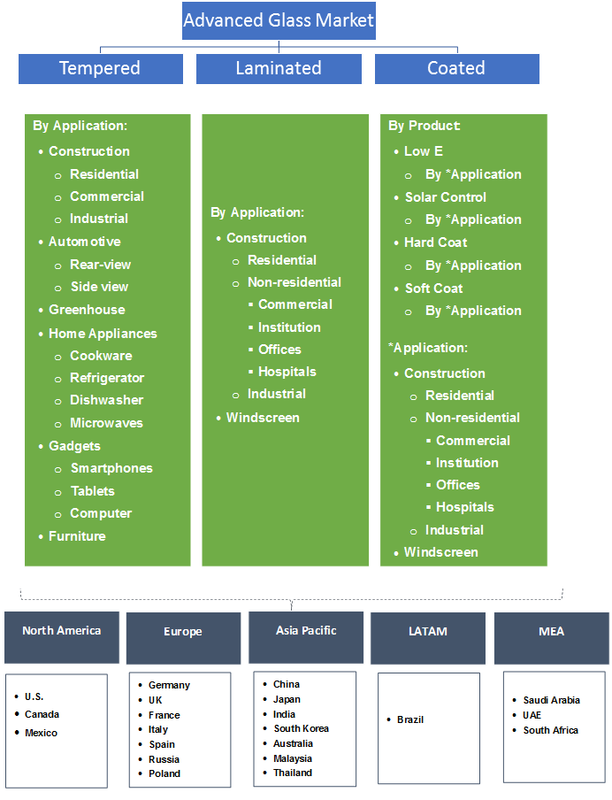 Global advanced glass market share is competitive & moderately consolidated and some of the industry players include Saint-Gobain, Guardian Industries, Sisecam Group, PPG Industries, Schott AG and NSG Co. Other manufacturing companies include, Sangalli Vetro Manfredonia, Glaze-Tech Industries, Abrisa Technologies, and AGC which serve to local and international market. Advanced glass has increased usage in construction and automotive industries owing to its special properties and characteristics. It is designed and manufactured through advanced technologies and undergoes specialized mechanical and chemical processes to increase its durability, strength and coatings. Rise in population and demand for affordable housings with increased industrialization rate has surged advanced glass market demand. Change in lifestyle accompanied with increase in per-capita disposable income has boosted automotive and construction sectors, which have thus propelled product demand.